I am taking a break from math workshop this week to write about how I organize for Writer's Workshop! I LOVE writer's workshop. Honestly, it is probably my favorite time of the school day. After a brief mini-lesson, I put on some classical music (which research says is the best "brain" music for writing....absolutely NO lyrics during writing time). Then we have a short period of silence where absolutely NO talking is allowed (this gives students time to think about what they will work on for the day), and then we are off and writing. I try to ensure that my students have 30 minutes of independent writing time per day. On some rare and wonderful days, they get more, but usually that is all we can squeeze in. It is a calm, creative and pleasant part of our day! If you also teach writing, you have probably discovered that the papers, notebooks, and "stuff" of writing can be hard to manage. If you don't have a system for keeping students organized, the paper shuffling can become a nightmare. Students will spend their valuable writer's workshop time looking for their work from the previous day instead of spending it on writing. I know many of you have been there...LOL! The system I have developed over the years is not perfect, but it has helped A LOT in keeping the paper shuffle to a minimum and allowed for more "pencil to paper time". "Writer's Notebook" can mean a lot of things to a lot of people. 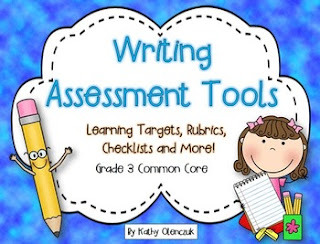 In my classroom, the writer's notebook is place where students can experiment with their writing and try out new things they are learning, without having to worry about being judged or graded. This is a simple composition notebook, decorated by the student, and used for all writing genres. They keep it in their chair pocket at all times, are welcome to take it home and can write in it whenever they have "extra" time. I encourage students to use the notebook to "play around" with the new writing strategies that we are learning during our writer's workshop lessons. I make it clear early on in the school year that I will never collect, or even read, their writer's notebooks unless I am invited to do so (by the student). Sometimes I will give students a writing activity for their notebooks. 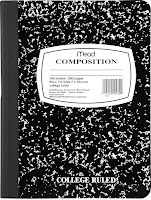 For example, if we do a "quick write" to get their juices flowing at the beginning of writer's workshop, I will have them do that in the notebook. I feel that it is really important that students have a "safe" place to try new things with their writing....no judgement, no critique, no grade. These get used A LOT....students LOVE them and often fill up more than one during the school year. And yes.....they can draw in them too! 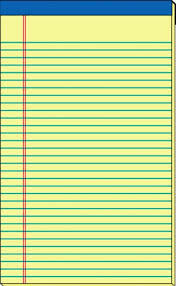 All students get a yellow legal pad too. I keep these in baskets rather than in their chair pockets because they only need them every once in a while and they are a bit fragile. We use these for creating a final draft of writing pieces that will be "published". Most of the writing units that I teach throughout the school year culminate into a final published project. For example, our first unit on Personal Narrative writing results in a story that each student makes into a book. They will work on the story for several weeks, taking it all the way through the writing process, including many revisions. The revisions happen as new mini-lessons are taught and students go back into their story to "try out" the new strategy they learned on some part of their writing piece. They do all of this "drafting" in their drafting notebook (which I'll talk about later in this post). The final step is writing out their story, including all of those revisions and edits, onto the yellow pad. This is a "polished" form of their writing piece which has been edited by the student who wrote the piece and a peer before being written out on the pad. Once they write out their piece onto the yellow pad, it is turned into me, the FINAL editor. I do any final edits, getting the piece ready for the final publication stage. Later in the school year, I stop doing final edits. I found that my fledgling writers get a little lazy and figure that I will fix things for them, so they don't put quite as much effort into their own editing. So, when I pull the plug on that, they don't like it so much because they DO want their piece to be correct, so they put a bit more effort into checking spelling, punctuation, etc. At the end of the school year, we tear out all of their drafts, which are taken home or recycled (their choice) and I keep the (now empty) yellow pad for the next school year. They can last a few years if treated gently. The drafting notebook is the most important component of our writer's workshop. This is where I place all of the lesson and strategy work that students will do throughout a unit. They get a new drafting notebook at the start of each new unit: Personal Narrative, Essay, Informational Writing, Research Writing and (if we are lucky), Writing Fiction. I use a lot of graphic organizers with students. I find that they really need them in order to fully understand how to use a new writing strategy. 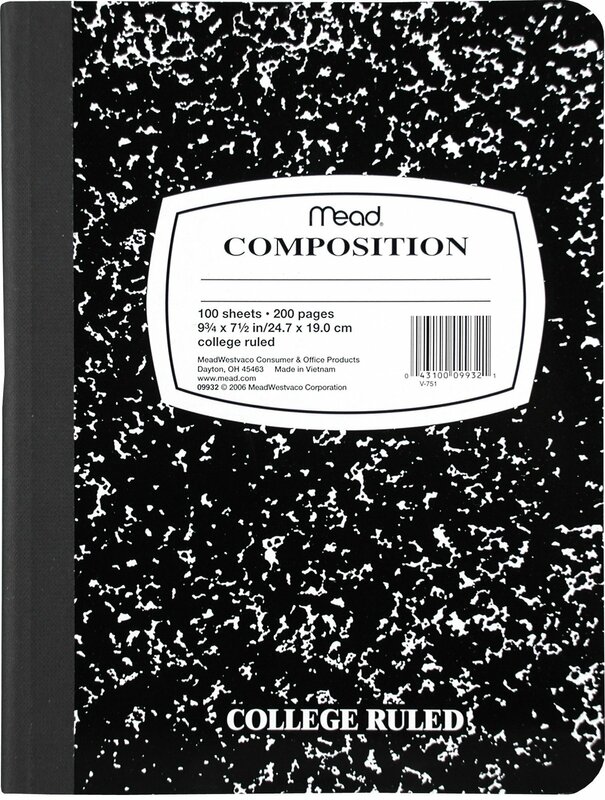 In my early days of using a writer's workshop students only had a blank composition notebook. They would write their stories and other pieces inside the notebook. When I taught them a new strategy, I would ask them to go into their notebooks and try it out on whatever piece they were working on. I trusted that they would, but there was no good way to check, so the accountability factor was missing. This is where the drafting notebook comes into play. I copy all of the graphic organizers that I will use with students during a unit, including lesson notes and examples of writing strategies in action. It's rather like a workbook (now there's an outdated term). I usually run this on a different color paper (students will need several copies in their notebook). You can get this form for free in my TPT store (just click on the photo above). The middle of the notebook is all of the graphic organizers that are specific to that unit. To get an idea of what I put in this section, check out any of my writing units on TPT. These units are collections of the graphic organizers that I use. All of them include the learning target of each mini-lesson and writing samples for each strategy. I use the writing samples for helping to teach the lesson, but to conserve paper, I do not include them in the drafting notebook. I teach a writing strategy, then the students try it out in the drafting notebook. They find a place in the story or writing piece they are working on and they revise it or rewrite in in the drafting notebook. And yes...then they also revise it in their actual story/piece (which they work on in their writer's notebook). All of these can be found in The Ultimate Writer's Notebook at my TPT store. There are a lot of other useful reference sheets for students included as well!! I use all of them frequently throughout the year for different purposes. I used to use our school binding machine to put together our drafting notebooks, but I now use the pocket folders with prongs. It is not as fancy but is much simpler to put together and more durable plus it is really nice to have pockets! In the back I also keep a data sheet for students to track their progress on the on-demand writing assessments and a goal-setting sheet. The rubric for each unit is kept at the front of the notebook or in the pocket. 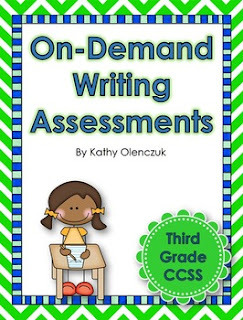 How do I assess student writing?? I use a combination of the work they do in the drafting notebook, on-demand writing prompts (given every few weeks), and the final versions of the writing projects that students complete for each unit. At the end of each writing unit, the drafting notebook goes home. It is wonderful for parents to be able to see all of the lesson work for each unit, including teacher feedback, and how their child applied those strategies to their completed projects. Thank you for visiting today! I hope you find this post helpful. 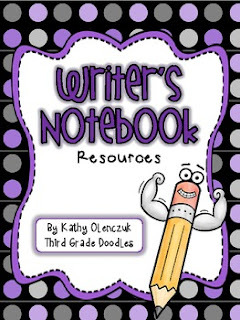 I would love to hear about how you organize writer's workshop in your classroom! Your writing resources are so helpful and have answered many of my questions! Thank you for blogging your ideas. 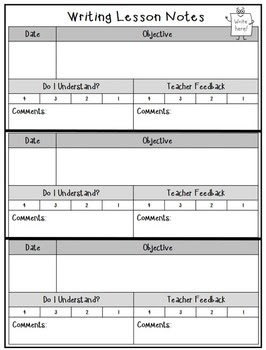 I can see how drafting notebooks can increase accountability and be easier for teachers to look through weekly. However, I am curious how writing/revising in their drafting notebooks benefits your students more than just using their writer’s notebook. Thank you! !